The day you open the doors of your business is both incredibly exciting and terrifying. For me, that day was December 5, 2011. That’s the day I opened the doors of my law firm. And for pretty much that whole first year I was in a state of nervous-excitement. That kind of nervous-excitement that makes you want to jump for joy and throw up all at the same time. Over the past six years, I’ve run hundreds of experiments. Some of them successful, most of them not so successful. I’ve put in a ton of hard work, but I also know that I’ve been lucky. One piece of luck was a chance to stay on as a contract attorney for the firm I’d been working at. And to keep working on a huge litigation project for an extra seven months. 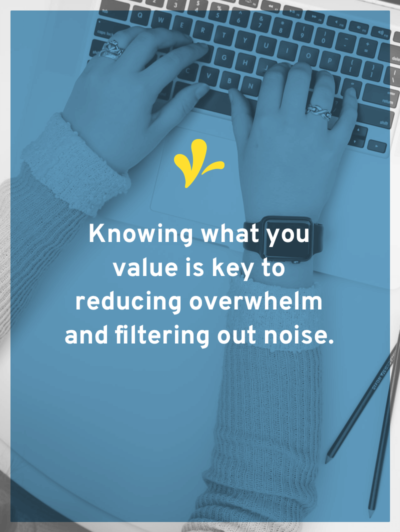 This knowledge allowed me to focus on the not-so-fun foundational work in my business. It gave me the luxury of time. So I could decide how I envisioned success. And the kinds of projects and clients that would help get me there. But I knew that without an end goal, these would only be vanity metrics. I also knew that doing this tough foundational work would help streamline my to-do list. 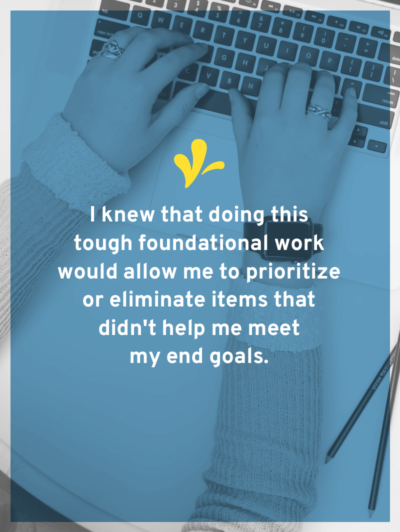 It would allow me to prioritize or eliminate items that didn’t help me meet my end goals. So I started brainstorming what success looked like. I knew that I didn’t want my law firm to be a stereotypical law firm. I knew that I wanted to create a place that I collaborated with my clients, empowered them, and they felt heard. Once I decided that was my end goal, I tested every suggestion and piece of advice against it. If something aligned with my goal and felt true to me, it got added to the experiment to-do list. If it wasn’t in alignment, it got tossed. When I launched the artist’s J.D. in April 2014, I repeated this process, with a slight twist. This time, I not only determined what success was. But selected three core values to guide my decisions. These core values were (and are) curiosity, listening, and empowerment. And I based my decisions, what went on my to-do list, and my experiments on those three core values. Still, to this day, these core values guide my decisions. They guide what projects I scrap, what advice I listen to, and what projects I fast track. As I mentioned, one of my core business values is listening. I strive to listen, analyze what you tell me, and create content based on the common themes I find. For example, I’ve heard time and time again that you save my emails and blog posts for when you have time to read them. And that when you do sit down and read them, you focus on reading content all on the same topic. After hearing this over and over, I started turning it over in my head. 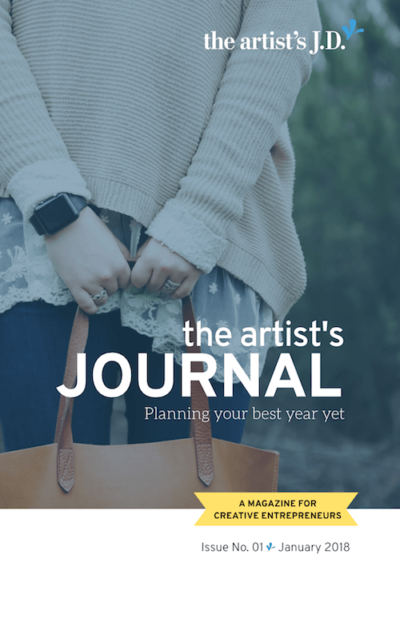 And that lead me to create this digital magazine, the artist’s Journal. the artist’s Journal is my attempt at giving you a one-stop shop to dive deep into a specific topic. It also allows you to dig into the magazine theme how you want. You can dip into individual articles or read the entire magazine in one sitting. My hope is to give you the tools and resources you need on that topic to find your own path. One that aligns with your own version of success, not the one anyone else puts onto your business. Grab the PDF version of Issue No. 1 focused on helping you create your best year yet. And as you might expect, I’m not sharing hacks or tricks. It’s all about your why, business values, and simplifying what’s on your plate. You’ll get all the articles and features to read, learn, and apply on your own terms. Values are the core of our businesses. They help establish purpose and direction. And they guide us when we need to decide between two viable courses of action. Your values directly impact your business. And in turn how you should prioritize your to-do list (legal or otherwise). 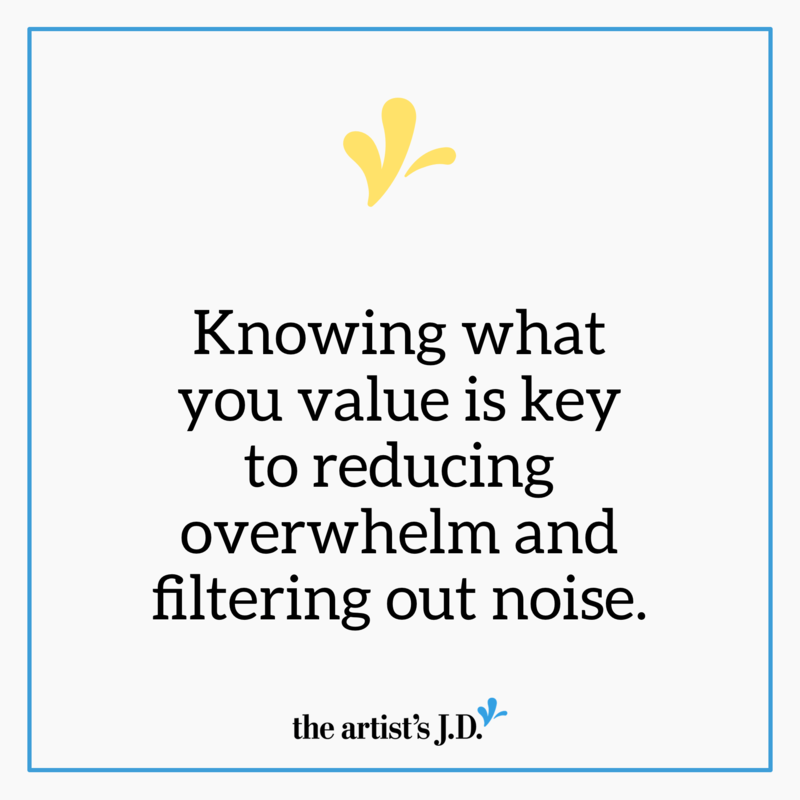 Ultimately, knowing what you value is one of the keys to reducing overwhelm and filtering out the noise. Grab the PDF version of Issue No. 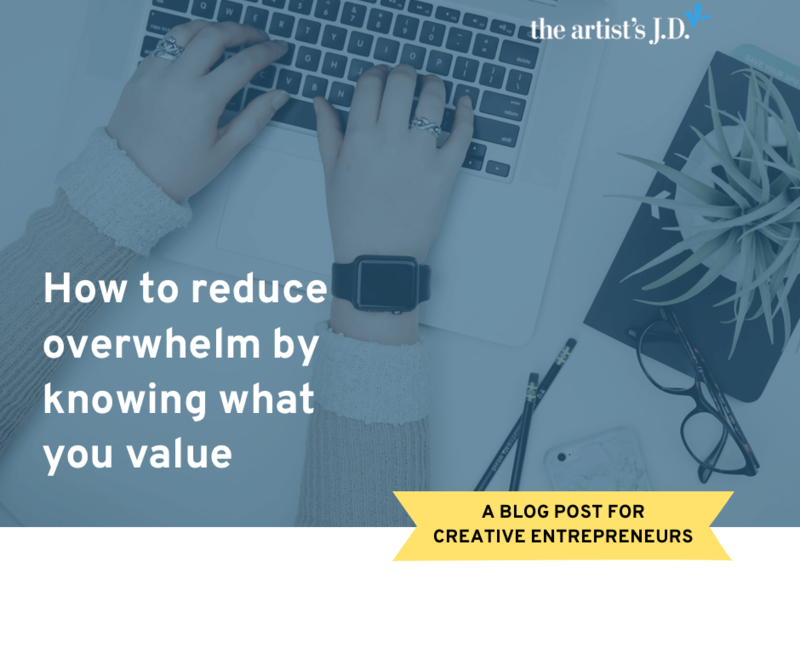 1 to not only get a PDF version of this article along with a list of more than 200 values that might describe your creative business. You’ll also get all the articles and features on how you plan your best year yet to read, learn, and apply on your own terms. Once you’ve brainstormed words, it’s time to narrow them down. Do this by examining them and removing one at a time. 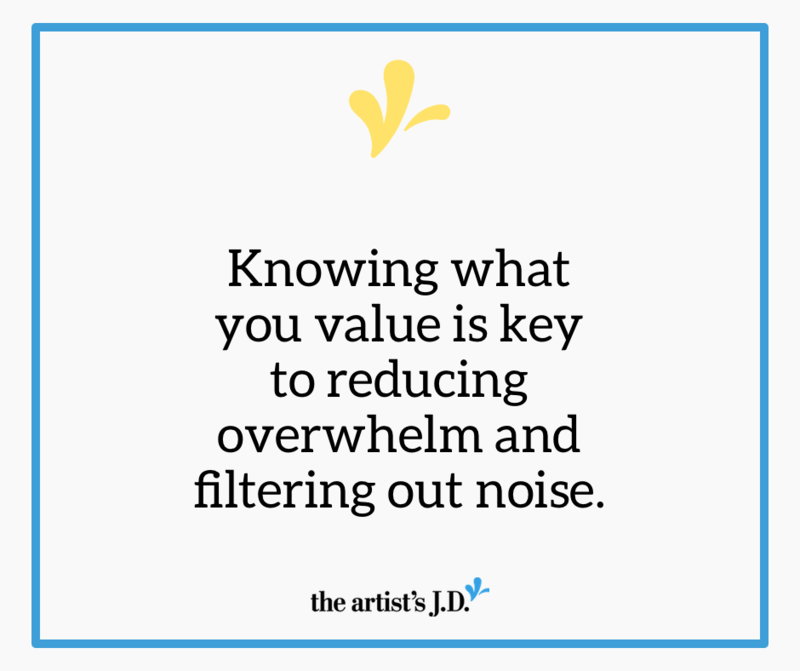 You’ll review them and remove the least important remaining value. Repeating this process until you are down to three words. These three words are your business’ core values. 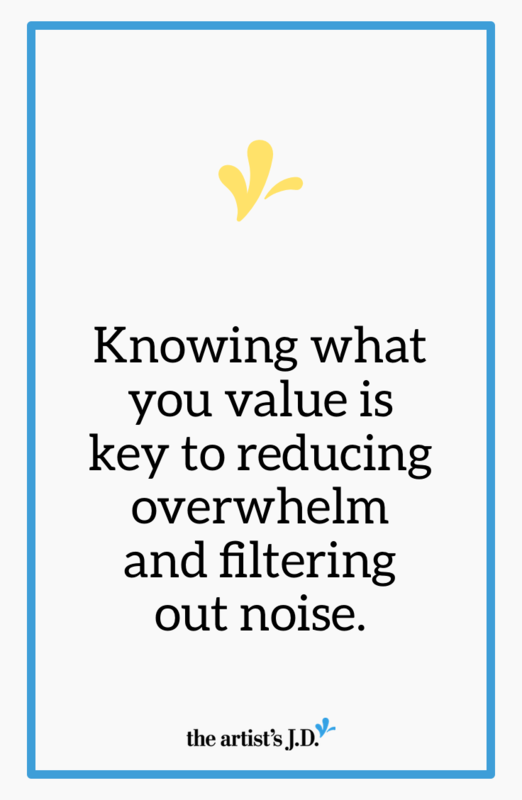 You’ll use these values to guide your business decisions. And determine the legal (and non-legal) tasks you should add or remove from your to-do list. 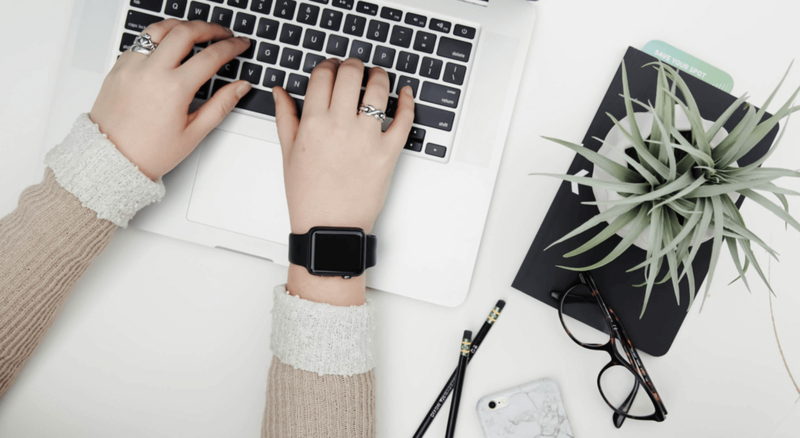 Do you legally need a business plan? Learn why I think it’s a necessity and how to quickly and easily put together a business plan. Overwhelmed with legal to-dos? 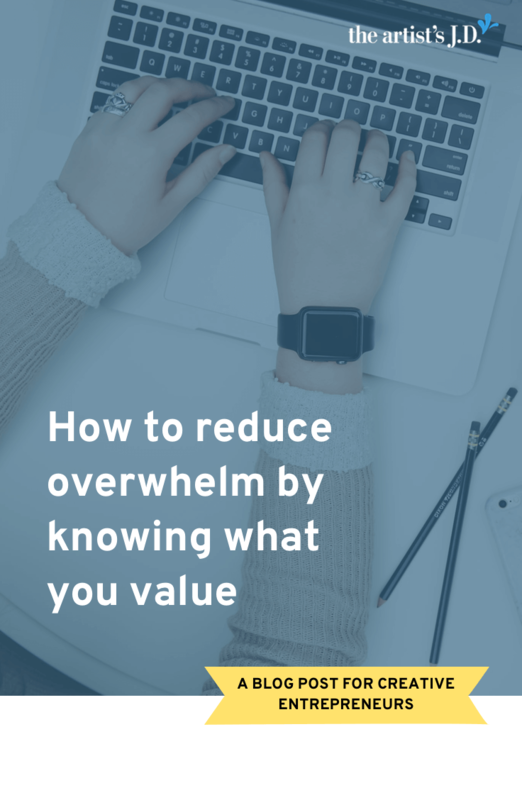 Learn how to prioritize which legal to-dos should (and shouldn’t) be on your list. Just getting started? Grab a quick and dirty checklist of the legal must-dos you should tackle when you are just starting out. Tired of being on this journey alone? Learn about how the artist’s Courtyard can be your guide, mentor, sounding board, and resource library so you don’t have to go at it alone. Once you have your three words, I’d love to hear them. So grab the PDF (or a dictionary), complete the exercise, and then share your three words in the comments below.